The heading reads: “HOW TO GET FROM HERE. TO HERE.” On the left, there’s a well-worn pair of work boots; on the right, a shiny new pair of dress shoes. 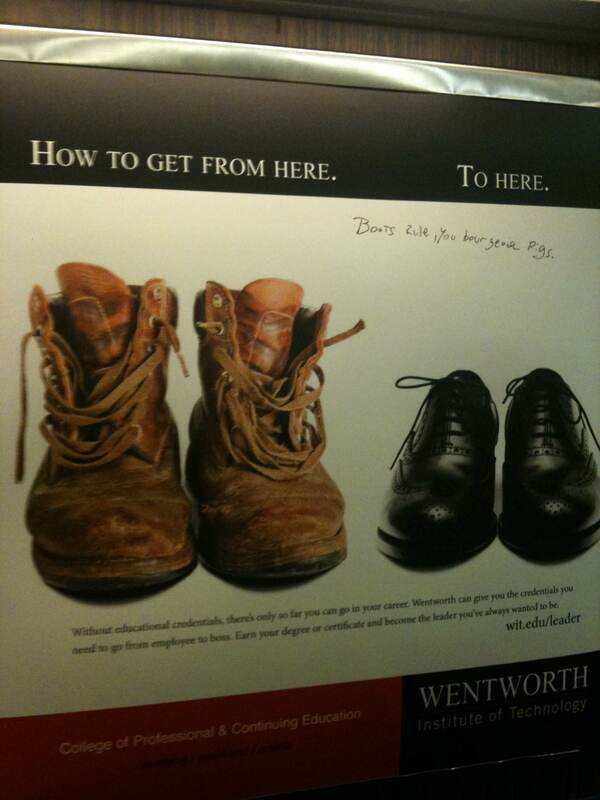 By that reading, the ad insinuates a repugnant idea: that trade work is inferior to office work and that anyone wearing boots to their job should aspire to someday have the privilege of wearing dress shoes, a privilege so enviable that they might want to consider becoming indebted to Wentworth to obtain it. Education should be a pathway to having greater choice and control in one’s work and life — I’ve experienced those benefits, and I think they should be available to everyone. But dress shoes represent a very narrow-minded idea of success. If Wentworth’s marketing department had used visual symbolism focused on choice and empowerment — if they had selected imagery that contrasts professional immobility with the increasing opportunity and self-directedness that can come with education, this might have been a decent ad. Instead, Wentworth presents a view of education as what? A credential shop? A class elevator? A place to change one’s fashion? I was glad to see that this sign received a bit of the graffiti it asks for.